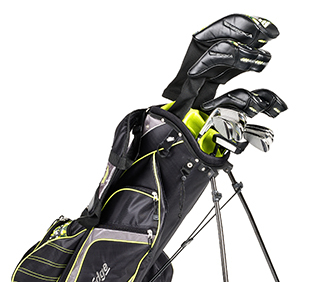 The Bazooka 460 Black complete mens package set is powered for performance! The popular 460cc Bazooka Black driver powers tee shots to unprecedented distances with high, accurate performance. The 460 Black fairway woods and hybrids are designed with a shallow face and a huge sweet spot to help players get the ball up in the air and on target. 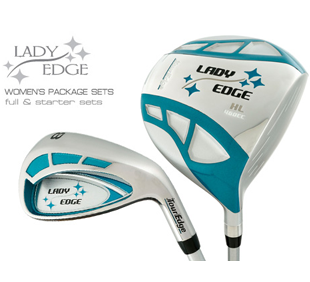 Your long game will reach new heights with high, powerful shots from any position on the course. Extreme perimeter weighting and an undercut cavity design make the Bazooka 460 Black irons incredibly easy to hit – far and accurate! Designed to provide a huge sweet spot, the iron’s face delivers a powerful launch – especially on off-center hits. The 460 Black putter features a high-MOI design to maximize the putter’s stability through the putting stroke. The result is better alignment at impact and straighter, more accurate putts. 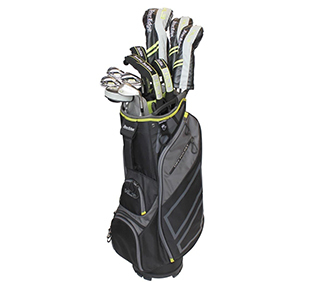 The set comes complete with a lightweight, dual-strap stand bag (with steel shaft iron set) or deluxe cart bag (with graphite shaft iron set) – with the Bazooka 460 Black complete set you’re ready to attack the course!